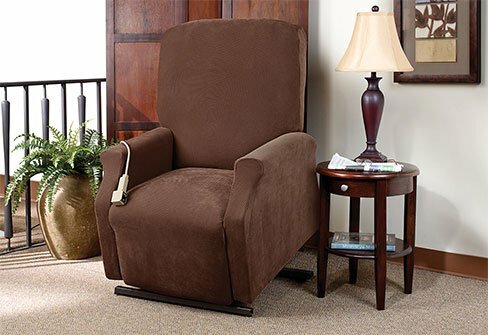 Recline in comfort knowing your lift recliner is protected from everyday wear and tear. This soft, waffle-textured form-fitting fabric is perfect for shaped furniture. Fiber content: 94% polyester/6% spandex. Imported. Machine wash separately in cold water, gentle cycle. Use only non-chlorine bleach when needed. Tumble dry low. Do not iron.